As I wrote in my previous post, I recently hiked on Mt. Fuji. Today's post is about the next day's bike ride, a 100+ mile odyssey that included two cycling climbs up Mt. Fuji as far as the paved roads would allow, a typhoon, and a dead iPhone. The dead iPhone explains why there are few photos on this post. There are no roads to Mt. Fuji's peak at 3,776m (12,389'), of course, but three roads go fairly high up. My initial goal of the day was to ride one of them, the same road I'd taken on the way to start the previous day's hike: the “Subaru Line”. It's a toll road that ends at the “5th Station”, at about 2,300m of elevation (7,550'). Many people start their Mt. Fuji hikes from where it ends. 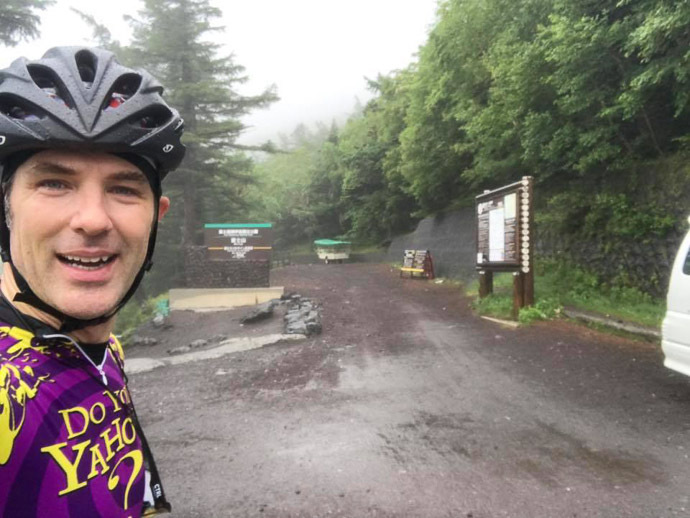 I was a bit apprehensive about the long climb, but also looking forward to it because the forecast was for rain all day, due to the typhoon that has passed the previous day; I enjoy riding in the rain when it's warm and I'm properly prepared for it. In this case, “properly prepared” means that I don't mind getting soaked and I don't have anything that'll be hurt by getting wet. 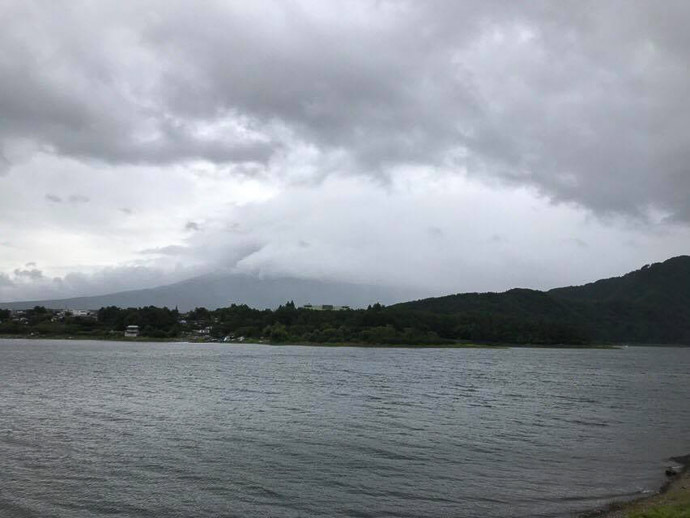 Having made the loop around the lake and returned to the road in front of the hotel, I turned toward Fuji. Within a few minutes I was on the road that heads up to the fifth station, rising quite consistently at a mild-but-relenetless 5% for its entire 30km (19mi) length. Half an hour in, I got to the toll booth and paid my 200 yen (US$1.80) and chatted with the tolltaker a bit. He said that there were something like five cyclists the previous day. I was probably the only cyclist this day, because, I would later find out, two hours later, just as I was arriving at the top, the road was closed due to high winds. And those winds, along with rain, started in earnest soon after I passed the toll gate. 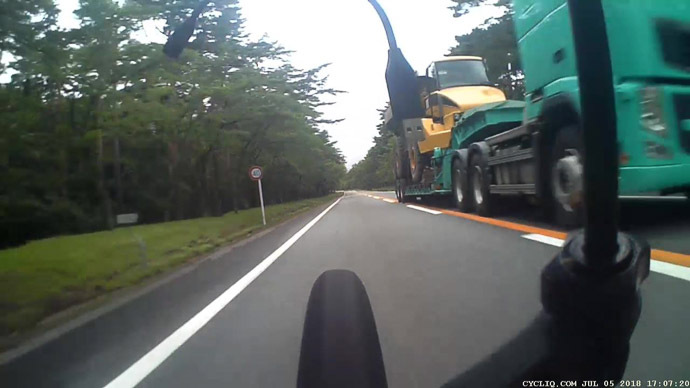 They didn't bother me much early on, as I just concentrated on passing the roadside markers placed every 100m, counting down the distance to the end of the road 23km away (Strava segment). I also counted the busses that passed. Extrapolating from the number that passed during one five-kilometer stretch, I estimate that about 120 busses passed me on the climb. The road on the way up is wide and sweeping and pristine — just lovely — and so when a bus or car wants to pass, it usually just swings out into the oncoming lane to do so. There's usually not that much traffic, but at one point a couple of buses had to wait before they could pass me, and it happened to be at the one short span on the entire climb where the steepness backed off a bit. So, to have some fun and to not make them wait so much, I sped up considerably. Soon the opposing traffic cleared and they passed, but because I was moving along at a good clip they just slowly creeped by me. The bus was full, and smiling faces in the window passed by slowly. It was fun. And just as I was giving a nod to someone at the window next to me, I saw 50m ahead two deer leap across the road. I'm glad that the buses had had to slow down for me earlier, or the deer might be venison. As I got closer to the top, the wind and rain got very strong, and for the last 3km or so I had such a strong tailwind that I was going 40kph uphill, where later on the return trip, despite now going downhill, I could barely manage half that speed because it was into the wind. It was the strongest wind I'd ever tried to ride in, but as it later turned out, that record would stand for only a few hours. On the way up, it takes considerable effort to ride, so that kept me warm despite the wind and rain and cold. I wouldn't have that on the way down, so I wore a raincoat, mostly as a windbreaker. I'd not thought to bring full-finger gloves, so I got two small plastic bags from the cafe and put them over my brake levers, and just used the brakes while my hands were inside. It worked great to keep the wind off, which is all I needed. And that wind was strong at first. I kept one foot unclipped just in case a gust blew me over, and twice within the first few minutes I came to a complete stop because the side-gusts were so scary. After a few kilometers of this stop-and-go, I got below some line and the strength of the gusts receded considerably. After that it was a lovely descent. I took it slowly because of the rain and wind, so it took 35 minutes (Strava segment), but on a nice day it'd have been a lovely descent to hit hard. The current best-recorded time is a 62kph-average 22:46. After exiting the toll booth, there's a 3km almost-completely-straight downhill section of road cut through the forest. It was still rainy and somewhat gusty, but I give it a good go, passing three buses (the only vehicles I saw the entire way down), earning a #14 spot on the leaderboard. I still felt good, so I thought I'd swing south to another of the three roads that head up Mt. Fuji. 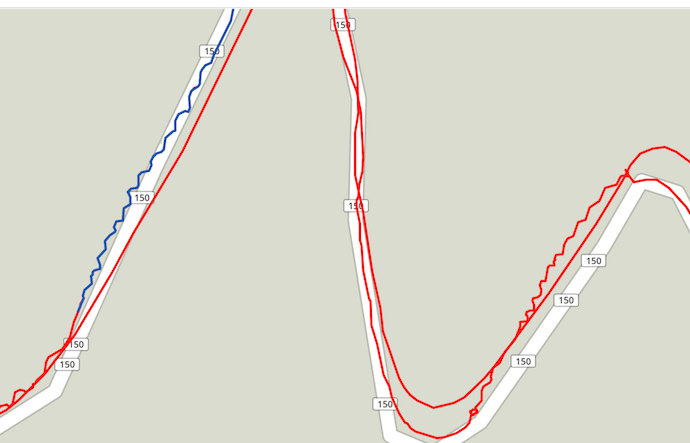 I hadn't researched it well, but I'd made a route for my Garmin so that I could get there. The start of the climb was about 20km away, mostly uphill as it turned out, but the last 6km was a lovely fast (if it weren't raining) descent. It begins near some kind of military base, as evidenced by the tanks that I saw moving around as I turned onto the road for the climb. The first 3km of road is ramrod straight, 10% grade, wide beautifully-paved road through forest, apparently flanked by more unseen military base, because at one point I almost jumped out of my skin when what I can only imagine was high-caliber machine gun fire erupted not far away in the woods to the side. Also early in the climb, my power-meter pedals started to give really crazy readings. And then, while having stopped to take a photo of something with my iPhone, the screen suddenly spazzed out in a very “the hardware just went bad” kind of way. I immediately powered it off. I didn't know it at the time, but it would never power on again, and Apple ended up replacing it. I lost all the photos from the day, save those I had messagedt to others or posted on Facebook. Anyway, I continued on the absolutely-pristine-road 10% climb as it transitioned from ramrod straight to serpentine, and after about 15 hairpins (and an hour), I'd done about half of the climb. 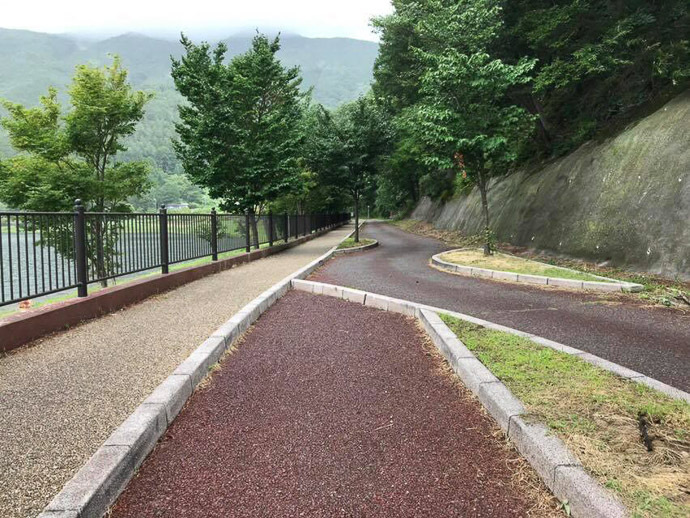 For those who know cycling in Kyoto, I'll point out that this first half by itself is both longer and steeper than Hanase, Kyoto's main hard climb. And from there, the second half of the climb gets even worse, as the road changes from “gorgeous pristine pavement” to typical old mountain road covered with moss and detritus, and keeps at it for 6km at 11%. It took almost two more hours, but I eventually did make it to the top. The wind at the very top — the last minute or so — far exceeded that from earlier in the day, and I was pushed up the last 50m without having to pedal! Thankfully there was a little store/cafe at the top. I got a $3 Coke and some food to recharge my batteries, and plugged in my Garmin cycling computer to recharge its battery. I also consulted with the guy at the cafe on how to get back, and was crestfallen to realize that the only reasonable way back to the hotel was to retrace my steps. The ride between the two climbs had included that long fast descent that was so lovely going down, but now in this exhausted state I'd have to ride back up it. Ugh. Steeling myself for the ride back as the cafe closed at 5pm, I braved the strong wind and rain for a minute until I dropped into the trees, and enjoyed the slow winding return down. It took 15 minutes before I returned to the straight section at the start of the climb, and couldn't help but give it a good go. This stretch of road just invites speed. The road is ramrod straight and beautifully paved. There are no cross streets. No buildings. Nothing.... no signs of civilization along the entire stretch. It just begs you to go as fast as you possibly can. But I didn't. The gusty wind and rain kept me on the brakes much of the way, but I was still going at 80kph (50mph), with my raincoat flapping like crazy. After finishing the descent, I spent 25 minutes climbing that hill I'd dreaded earlier, then an easy ride back toward the hotel. Much of it was along a main road choked with traffic (the “Fanuc Jam”, the daily traffic jam from workers at robotics company Fanuc, where Krish and Ram used to be executives). I could fly by on the side, which is always fun. 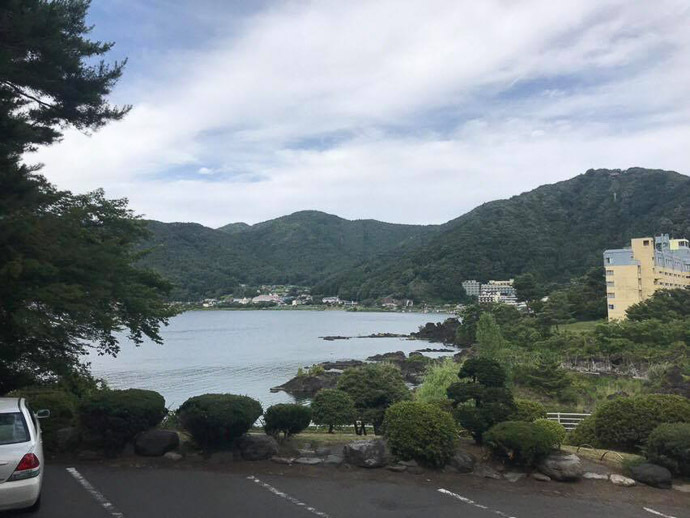 Once I got near to the hotel, I decided to end with another loop around the lake, so as to give me more than the 161km total distance required for a “century” 100-mile ride. This gave me my 14th-longest ride, and my 21st “century”. With 3,485m (11,434') of climb, it tied for my 6th-most climb in a day. I got back to the hotel at 7:15pm, in good spirits but quite tired. 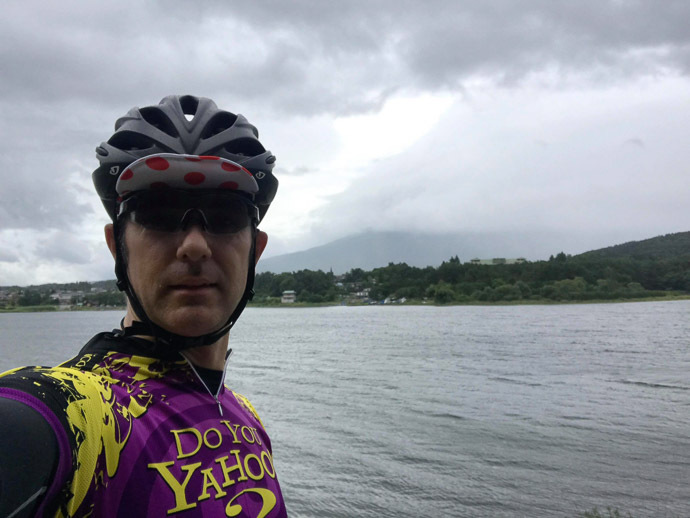 According to Strava's “Relative Effort” metric, this was my 2nd-most-difficult ride ever, falling between the 400+km pair of loops around Lake Biwa last fall, and the “Stupid Cycling Tricks” ride from a year prior. It also bumped up my Eddington number to 68, the first change since the 400-km ride in the fall had put it to 67. It won't bump up again any time soon, as I need 10 rides over 112km for it to move to 69. The military base you refer to is the 自衛隊 Fuji training base, which is also next to (relatively speaking) the proving ground of my past employer in Japan. On my first trip to the proving ground, when I got out of the taxi and starting walking to the building I had businesses at, heard/felt low rumbling and when I asked, was told nonchalantly the 自衛隊 were having artillery practice that day.